Password recovery for Windows, OS X, iOS, Android, Linux - PC Buyer Beware! The good news concerning password recovery is that every operating system provides a way to recover or reset its login password. The bad news is that if a thief has physical access to the computer, he can also get past the login password. For that reason, you should NEVER have information, such as online bank account or store login information on a computer that does not have its data encrypted. The good news is that if the data on the computer’s hard disk or SSD drive is encrypted – if the computer uses full-disk encryption – there is no way that anyone, except the user(s) authorised to do so – by virtue of possessing the login password – can access the data on that computer. The bad news is that if the encryption password (encryption key) gets lost, password recovery is impossible and the data is lost forever. In that case, the only way to get the computer up and running again is to clean-install the operating system, reinstall all of its software and redo settings. You won’t be able to restore a backup or system image that uses the same password. If you have that option, you could restore the computer back to its factory state, but that is usually not a recent restoration. For that reason, I prefer just making sure that my computers do not contain any data that could be used to raid any of my accounts if any of them were stolen. Recent Apple and Android phones and tablets have encryption enabled by default. Remember when Apple was required by the FBI to crack into the encrypted phone belonging to a US terrorist? The US and UK governments are seeking powers that provides them with backdoors into encryption so that their security services can read or listen to everything that takes place on encrypted devices. The following article from September 2014, is still worth reading. Note that password recovery tools that are not the official products of the major operating systems are available. However, since some of them are malware to begin with or have become malware after being made available for download on unofficial sites, I am not providing any information about them here. It is still possible to use a local user account to set the login password in Windows 8.1 and 10 (earlier versions of Windows only use a local account). But now for mostly commercial reasons, Microsoft prefers users to log in using a Microsoft account, of which there are several, such as Outlook.com, Hotmail, @live.com, @msn.com, etc. You have to use a Microsoft account in order to use the Store for apps, etc. It is also possible to use your own private email address as a Microsoft account. However, be aware that Microsoft, like Google and Facebook, collects information about you for marketing purposes. Information that governments can also access. If you use your Microsoft account’s password to log in to Windows 8.1 and 10 and you forget it, it is possible to reset it’s password to regain access to Windows. Of course, you must have provided your account with an alternative email address or mobile phone number to be able to do that. 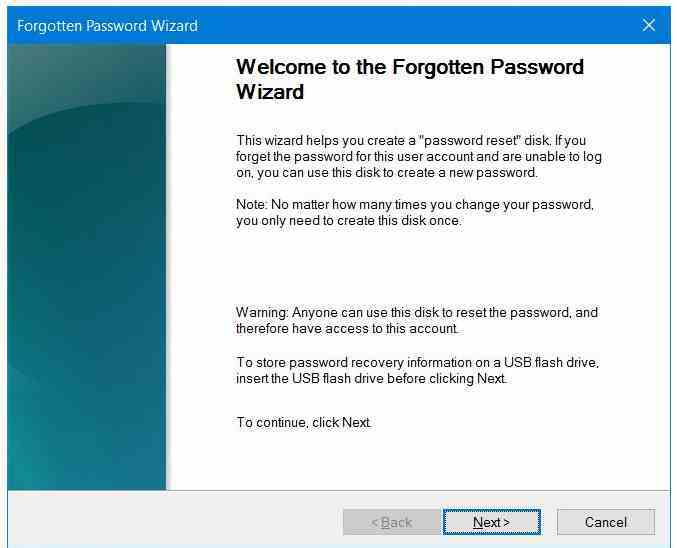 You just have to try logging on to your online account from another computer and use its “Forgotten your password?” option to have a reset option sent to your alternative account or device. 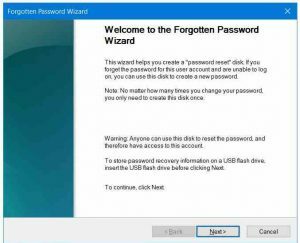 Alternatively, if you are using a Windows local user account, you can create a password reset CD/DVD disc (Windows XP/Vista/Windows7) or USB flash drive (Windows 8.1/10). Here is the information on how to do that for Windows 10, which creates a “Reset Disk” that is really a reset USB flash drive. Web-search for information on how to create a reset disc for earlier versions of Windows. Of course, you can also use the Reset option in Win10 that wipes EVERYTHING and resets Win10. Note well that you’ll have to reinstall ALL of your software and data. Of course, if you forget your Apple ID’s password, you will be able to regain access to your Mac computer. The sign-in screen provides the options that take you through the procedure. Use the verification method that is associated with your iCloud account, which could be a mobile-phone number. Alternatively, the MAC recovery mode provides a password reset tool. To go into it, click on the Apple menu and choose Restart. The Mac boots into recovery mode if you press both the Command and R keys as the computer starts up. Select Terminal in recovery mode and enter the resetpassword command. You should now have access to the Reset Password utility. You can use this tool, which is also on the Mac OS X installation disc, to reset the password of any user account on a Mac. Apple’s mobile devices – iPhone, iPad and iPod touch – use Apple’s mobile operating system, iOS. Performing a factory reset is the only way to regain control of those Apple devices if you forget your password. There is no way to reset the password. The user manual for each device provides the information on how to reset it. Fortunately, if you have an Apple ID and have its password, you can restore your device’s data by using iCloud backups. Alternatively, if you’ve backed up your Apple mobile device to iTunes on a computer, by connecting the device to your computer, you can restore it fully. Note that if you lose your phone or it is stolen and you’ve set up Find My iPhone, it is possible to log in to icloud.com using your Apple ID and erase its data. It is possible to reset the lock screen code of an Android device if it is using a version of Android prior to version 5.0 (Lollipop – 2014). Lollipop and subsequent versions do not provide that option. With versions of Android from version 5 and higher, to regain access if you’ve lost lock screen code requires performing a factory reset from recovery mode. The reset wipes all of the data. You can then use your Google account to set up the device once again. 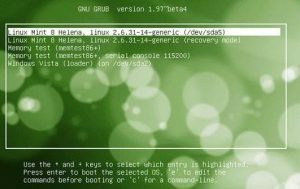 You can access the Recovery mode for most distributions of Linux from its boot menu. The image below shows the boot menu for Linux Mint 8 Helena, which was up to version Serena 18.1 in June 2017. Recovery mode is the second option. Choose “Root – Drop to root shell prompt” option in the Recovery Menu. Use the root shell to reset passwords on the system. Note that if the Grub boot menu is locked and password-protected, boot with your Linux Mint installation disc, from which the full version of Mint can be run. You can change the login password when it is up and running from its disc. The following webpage provides alternative ways of getting to the root shell. June 5, 2017 in PC Problems and Solutions, Software Problems, Windows XP/Vista/7/8.1/10 Problems.